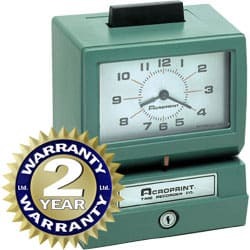 A heavy-duty punch clock such as the Acroprint 125 time clock can handle thousands of print registrations per day. These dependable workhorses feature a tough, rust-resistant case that stands up to harsh environments. They're suitable for any size business. They carry a full lifetime warranty on the typewheel and a 1-year warranty for the rest of the materials. These versatile time clocks can be built to order with a variety of typewheel configurations including left-hand printing, Spanish month wheel and/or a symbol wheel. If you need a time clock in an area with unreliable or no AC power, there's even a battery-operated version available by special order.